The EpiSonic™ Multi-Functional Bioprocessor 1000 is part of the latest generation of sonication devices for use in a wide range of biological applications, including DNA and chromatin shearing for high throughput genome sequencing and next generation chromatin immunoprecipitation (ChIP). This completely digital instrument allows for rapid processing via 96 samples at a time and can be easily integrated into existing lab workflows. True high throughput format -- process samples with 96 PCR tubes (0.2 ml) or a 96-well PCR plate. Rated Current 100 VAC - 120 VAC, 7 Amps max. 220 VAC - 240 VAC, 3.5 Amps max. The major features of next generation ChIP and genome sequencing are speed, efficiency, and high throughput capability -- rapid and massive generation of random DNA fragments in the optimized size is critical. There are several methods for fragmenting chromatin and DNA, which include enzymatic digestion and physical shearing such as probe sonication and nebulization. However, such methods have been too limited for next generation ChIP and massively parallel sequencing -- enzymatic digestion generates sequence-specific cleavage bias, while probe sonication and nebulization cause cross-contamination between the samples, inconsistent shearing, and fail to provide multiplexing capacity. As the most advanced shearing system, the EpiSonic 1000 avoids these problems and perfectly meets the requirements of next-generation ChIP and genome sequencing. For a successful ChIP, it is crucial to prepare the optimized target protein bound-DNA fragment (200-700 bp) and to maximize binding of antibody to the target protein. Using the EpiSonic 1000 and the included chromatin shearing protocol for ChIP, chromatin can be sheared to an optimal size range (200-700 bp) within just 15 minutes. The EpiSonic 1000 can be combined with the ChromaFlash One-Step ChIP Kit for true next generation chromatin immunoprecipitation. ChromaFlash is a next generation ChIP technology developed by Epigentek through the use of EpiSonic. It enables chromatin shearing and immunoprecipitation to be simultaneously carried out on the EpiSonic sonication system, greatly propelling the entire ChIP process to the fastest speeds in a high throughput format with high efficiency. This EpiSonic-based next generation ChIP technique, from chromatin to purified DNA, can be finished within 60 minutes in a 96 to 384-well format, which is extremely useful for high throughput mapping of global protein-DNA interactions through ChIP-Seq. High demand for massive parallel analysis of genetic and epigenetic alterations has driven the development of high-throughput sequencing technologies that parallelize the sequencing process, producing thousands or millions of sequences at once. Controlled DNA fragment size range. Because different downstream applications may need different fragment size ranges, the EpiSonic can generate different fragmentation ranges by digitally adjusting the sonication duration and output power. High compatibility. Use of standard laboratory disposable tubes/vials; flexible range of number, volume, and type of various samples; compatible with downstream workflow steps and various high-throughput sequencing platforms. High throughput format. Simultaneously sonicate 96 to 384 samples in a single run. Fig. 1. Dynamic Chromatin Shearing | MDA-231 cells were fixed with 1% formaldehyde at 37°C for 10 mins. 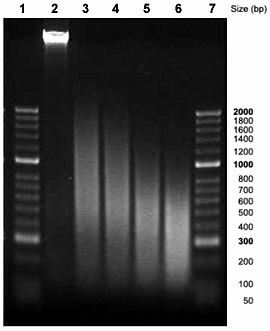 1X 106 cells were lysed in 100 µl of sonication buffer and sonicated in a 0.2 ml PCR tube with the EpiSonic 1000. Each lane shows purified DNA fragments from sonication conditions of 20 sec. ON and 20 sec. OFF, 140 W with different cycles. Lanes 1 and 7: markers; Lane 2: unsonicated control; Lane 3: 5 cycles; Lane 4: 10 cycles; Lane 5: 15 cycles; Lane 6: 20 cycles. 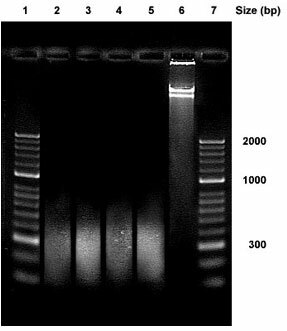 Ideal DNA fragment size (200-600 bp) for ChIP was generated under sonication conditions of 20 cycles in 13 minutes. Fig. 2. DNA Shearing | Placenta DNA in 100 µl of buffer was sonicated in a 0.2 ml PCR tube with the EpiSonic 1000. Lanes 1 and 7: markers; Lanes 2 and 3: DNA fragments from 1 µg and 2 µg DNA, respectively, using sonication conditions of 30 sec. ON and 30 sec. OFF, 120 W, 30 cycles; Lanes 4 and 5: DNA fragments from 1 µg and 2 µg DNA, respectively, using sonication conditions of 20 sec. ON and 20 sec. OFF, 120 W, 30 cycles; Lane 6: unsonicated control. Ideal DNA fragments (100-500 bp, average 200-300 bp) for next-generation sequencing templates or library preparation can be generated from these sonication conditions. *Always use the actual User Guide that shipped with your product. Is the above file locked? You can also request user guides by emailing info@epigentek.com along with your contact information and institution name.